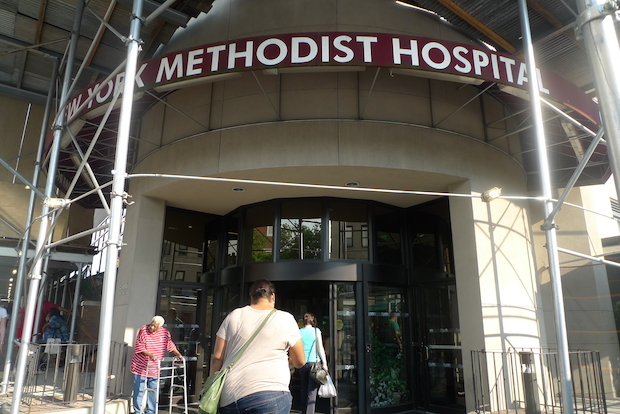 PARK SLOPE — New York Methodist Hospital will have to share more details about why it needs a new outpatient center and how expansion might affect its neighbors before a city panel will weigh in on the development. After more than two hours of testimony from both opponents and supporters, the Board of Standards and Appeals on Tuesday postponed voting on the zoning variances Methodist needs to build its new Center for Community Health in the size and shape it wants. The new vote is scheduled for April 8. BSA commissioners said they want the hospital to give a more thorough explanation of what's driving the need for the building before they make their decision. The panel also wants Methodist to consider shrinking the height of the proposed eight-story building, and commissioners want to see renderings that show the facility in the context of low-rise Park Slope. Hospital spokeswoman Lyn Hill said Methodist officials were confident they would be able to answer all of the BSA's questions. "Given the complexity of this project, we expected that the BSA commissioners would request additional information before rendering a decision," Hill said in an email. Locals who've criticized the hospital's building proposal as an oversized development that doesn't fit in residential Park Slope walked away from Tuesday's BSA hearing feeling vindicated. "It's really good that [the hospital] is being expected to demonstrate need...and they're being asked to demonstrate that there's a reason for these variances," said Beth Morrow, who lives near the hospital. Stuart Klein, the attorney for the group Preserve Park Slope, said he was "happy that the board saw the infirmities in the application." The new structure, which will require the demolition of 16 hospital-owned buildings, will span the block between Fifth and Sixth streets and Seventh and Eighth avenues. It will house an outpatient surgery center with 12 operating rooms, an endoscopy suite with six special procedure rooms, a cancer center and other facilities. Methodist officials have said the Center for Community Health is essential to the hospital's long-term survival because demand for outpatient services is growing quickly. At Tuesday's hearing, hospital representatives said the new center would provide an efficient "one-stop shop" that would streamline healthcare for patients and doctors alike. They also made the case that Methodist treats patients from across Brooklyn, and that an expansion will benefit the entire borough. Marjorie Momplaisir-Ellis, a program director at the nonprofit CAMBA, which works with low-income families, told the BSA she supported Methodist's expansion because the hospital serves a growing number of needy patients. She said the expansion will mean that patients from neighborhoods such as East New York, Brownsville and Crown Heights can "count on a high-quality institution in their own borough." But Klein, the attorney for Preserve Park Slope, questioned Methodist's "self-reverential" tone about serving the poor. He noted that a 2011 study commissioned by the state Department of Health found that Methodist ranked third lowest of Brooklyn's 15 hospitals in serving Medicaid patients. Methodist supporter Irene LoRe, the former head of Park Slope's Fifth Avenue BID, said "wanting a bigger and better Methodist is a no-brainer," especially in light of Brooklyn's shaky healthcare landscape. "St. Vincent's is gone, the future of LICH is uncertain," LoRe said. "Brooklyn needs more healthcare services, not less."